Very small levels of radiation from Japan have been detected in at least 15 states -- it's not a health concern, according to EPA. 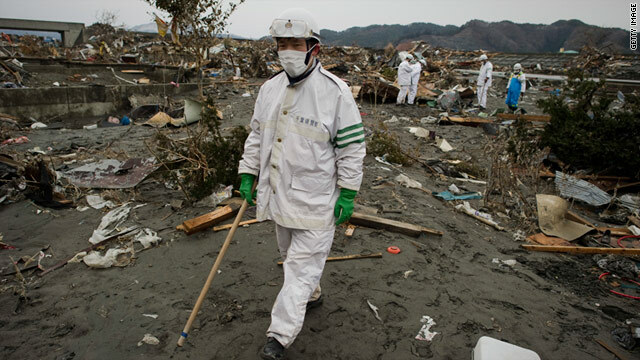 (CNN) -- Minuscule levels of radiation from Japan's Fukushima nuclear plant incident have been detected in a widening number of U.S. states, but the Environmental Protection Agency reaffirmed this week that the levels represent no threat to public health. "To date, data from EPA's real-time radiation air monitoring networks continue to show typical fluctuations in background radiation levels," Jonathan Edwards, director of the EPA's Radiation Protection Division, said in a statement Monday. "The levels we are seeing are far below any levels of concern." At least 15 states reported detecting radioisotopes in air or water or both. No states have recommended that residents take potassium iodide, a salt that protects the thyroid gland from radioactive iodine. Progress Energy reported over the weekend that iodine-131 was detected in the air near its nuclear power plants near Hartsville, South Carolina, and Crystal River, Florida. "We know that it's not coming from our plant," said Progress spokesman Drew Elliot. Had the U.S. nuclear plants been responsible for the radioactive iodine, other isotopes would also have been found, he said. The levels detected were so low that authorities do not require they be reported, he said. Sensors in Maryland have also reported elevated levels of I-131 in air samples. "None of these levels pose a risk to health," the state's Department of Health said. The Maryland secretary of health said Monday that microscopic amounts were also discovered Friday in rainwater. He said the levels found posed no risk to public health. The Massachusetts Department of Health said Sunday that a monitoring station in Boston detected I-131 in rainwater on March 22, but had not detected any in air. In a question-and-answer page on its website, it says the amount detected should not concern residents. On Monday, Pennsylvania Gov. Tom Corbett said rainwater collected Friday from his state's nuclear power plant facilities contained low levels of iodine-131 "likely originating from the events at Japan's damaged nuclear plants. But weekend tests of drinking water found no elevated levels of radioactivity." The levels reported "are still about 25 times below the level that would be of concern," Corbett's office said in a statement. Similar testing in other states, including California and Washington, has shown comparable levels of iodine-131 in rainwater samples. Trace detections were found in the air in Oregon, Colorado and California. Duke Energy spokeswoman Rita Sipe said Duke Energy had detected trace radioactive elements, likely to have originated from Japan's Fukushima plant, in North Carolina and South Carolina -- but at a level "far below" reporting requirements. EPA is using the nationwide radiation monitoring system, RadNet, to monitor the nation's air and drinking water, milk and precipitation. An analysis from 12 monitors nationwide found "slightly higher" levels of radioactive isotopes in Alaska, Alabama, California, Guam, Hawaii, Idaho, Nevada, Saipan, the Northern Mariana Islands, and Washington state over the past week, the agency said. "Some of the filter results show levels slightly higher than those found by EPA monitors last week and a Department of Energy monitor the week before," the agency said. "These types of findings are to be expected in the coming days and are still far below levels of public health concern." A spokeswoman for the EPA said Monday that 90 percent of the 124 RadNet monitors were working.